Blockchain advocates ledger system that facilitates the recording of every cryptocurrency transaction which in turn paves way for a value exchange on a decentralized basis. With a cryptocurrency exchange, you shall be a vital part of the digital revolution coming your way. As a professional Blockchain Company, SHAMLA TECH specializes in cryptocurrency exchange software development to bring about faster and more secure crypto transactions. Our team of passionate and skilled Blockchain developers builds personalized cryptocurrency exchange platforms characterized by high performance and top-notch security. Get in touch with us now to create a promising cryptocurrency exchange to cater to your commercial purposes. Need Advise for your Business? What do we offer as a Cryptocurrency Exchange Development Company? Being a full-fledged cryptocurrency exchange development company, we set new standards in the developing efficient cryptocurrency exchange software. We make sure that your cryptocurrency exchange platform goes live at the soonest. We facilitate you to connect with your potential customers and that shall help you to take lead among your competitors at ease. The Biometric mobile wallet makes use of the fingerprints of the users in order to add an extra layer of security to the crypto transactions. The two-step authentication of the wallet usually comprises of the password and fingerprint verification. We thoroughly test the cryptocurrency exchange platform with real users before it actually goes live so that the bugs and other possible discrepancies are aptly fixed. 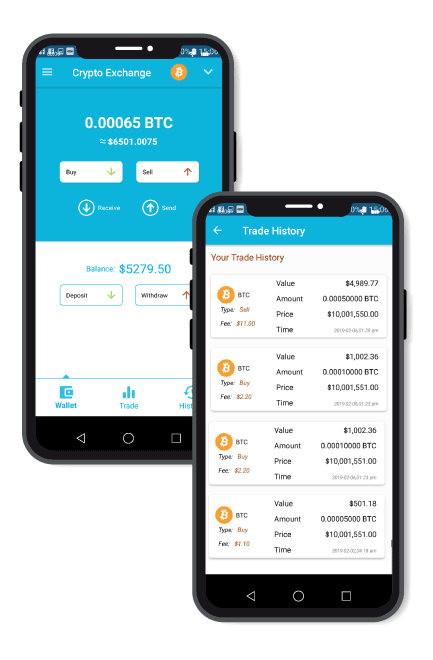 The cryptocurrency exchange platforms we build come with perfectly tailored native and cross-platform Android and iOS applications that work via socket programming. With an efficacious referral system, a cryptocurrency exchange platform can attract fresh users all at ease in a short span of time. 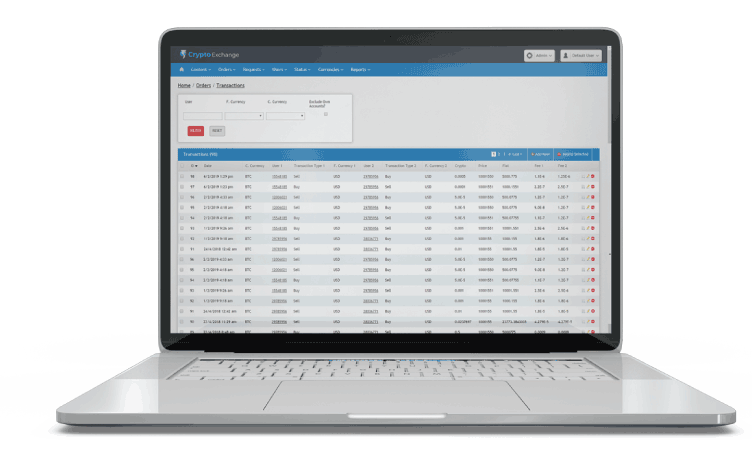 The admin panel makes the management part simpler and less time consuming by presenting you with a comprehensive set of digital tools to see to the operations. The one-page exchange speeds up the work mechanism of the cryptocurrency exchange by way of taking away the authentication procedures such as KYC and AML and allowing cross-platform cryptocurrency exchanges. 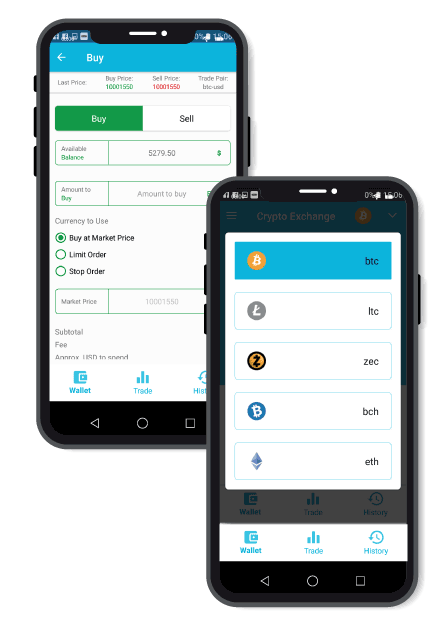 The one-page exchange comes as a surprise package for the crypto investors with its simple and trendy user interface, fully protected crypto wallets, matching engine and other special backend functionalities. Unlike the conventional cryptocurrency exchanges in which the tokens act as mere pathways for discounts, one-page exchange makes way for the tokens to be listed in order to avail vital commercial benefits. With the absence of the intermediates, the exchange costs are standardized and there is no chance for fluctuation in the same. Since the exchanges are decentralized in one-page exchange, there are no third parties involved to process the corresponding cash transactions. In one page exchange, the users are promised a safe login with the backup codes and QR code verification. Since the negotiation takes place on a peer to peer basis, the users are guaranteed utmost privacy. Encryption of data safeguards the important credentials and other confidential information. Coin exchange between the parties concerned with the help of a smart contract or a trusted intermediate. Why do you need a Cryptocurrency Exchange Platform? 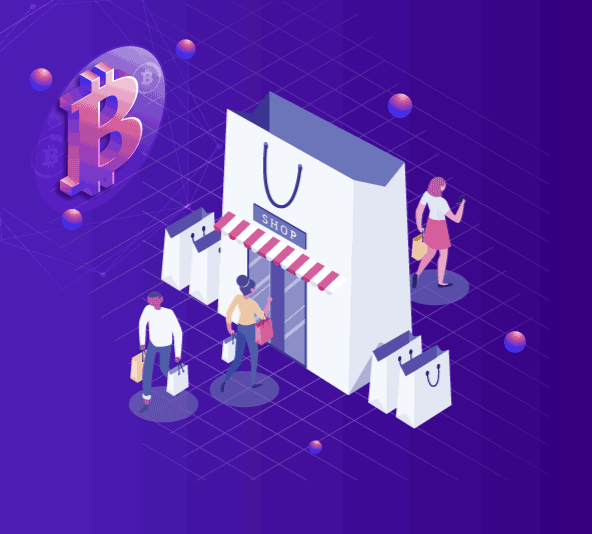 A cryptocurremcy exchange platform is mandatory for crypto trading and it is this platform that makes the purchase and sale of cryptocurrencies possible. There are two types of cryptocurrency exchanges; Fiat exchange and Altcoin exchange. Fiat exchanges facilitate users to acquire cryptocurrencies with fiat money like dollars, pounds, Euros credit card and cash. On the other hand, Altcoin exchanges require the users to make a crypto deposit before trading. The major highlight of the cryptocurrency exchange platform is that the processing charges are curtailed to a greater extent saving money. We work with businesses of different sizes and render cryptocurrency exchange platform development services with skilled and enthusiastic developers. Our solutions are fully personalized to cater to the commercial needs of our clients. 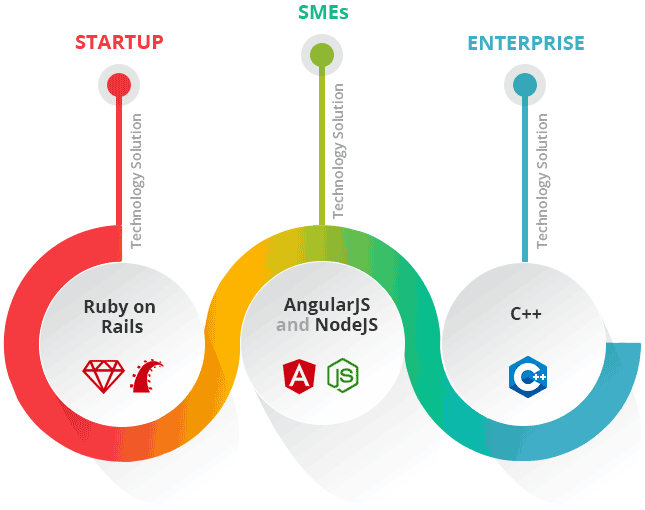 Based on the complexity associated with each cryptocurrency exchange development project, we employ different advancements including C++, Angular and NodeJS.